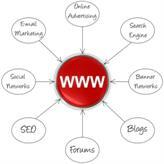 Search Engine Marketing is often confused with off-page Search Engine Optimization. While both of them may target the same media (e.g. Video or Article Directories), their purpose is different; SEO is primarily concerned with obtaining links, while SEM with bringing targeted traffic to your site. For example - posting a poor article on in an Article Directory will get you a link, but it won't get you traffic. There are many traffic generation techniques and link building strategies, with new ones being created on a daily basis. If you would like to learn more about Online Traffic Generation Techniques and Link Building, our Internet Marketing Tools page and the Blog have a lot of helpful tips and links to resources that can help you in your quest. page. We also recommend that you invest in a Strategy Consultation. Getting professional advice early in the game will help you save money in the long run. We currently offer web design packages that include entry-level website promotion and link building. The packages are designed to get your site indexed as fast as possible and propel it in the right direction. When we market your website, we use a combination of all the above marketing strategies to give you the best value for money, but we can also offer you a specific approach e.g. PPC advertising, if you need to get quick results.